Buckle-up and head to the library with your family for a summer full of fun! Check our calendar for events & performers throughout the summer. 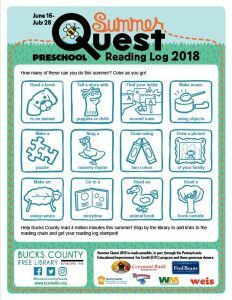 Help Bucks County read 4 million minutes this summer! Beginning June 16, we challenge YOU to sign up and log your summer reading minutes! Stop by your branch for your reading log or download one of the logs below. 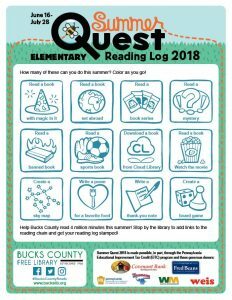 Visit the library to add links to Bucks County’s reading chain and get your reading log stamped! Visit the library for storytime throughout the summer! Learn, grow, and read by completing reading log challenges. 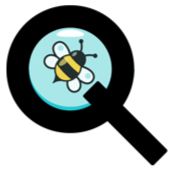 Earn special Badge Squad Summer Quest badges by completing challenges at the library! Have an idea for a badge? Design your own during our Badge Contest! Challenge the children to see who can read more this summer! Find your next great read at: cloudLibrary, hoopla, NoveList. Share what you’re reading on social media by tagging #BucksCountyReads. Find us on Facebook, Instagram, and Twitter as BucksCtyLib. 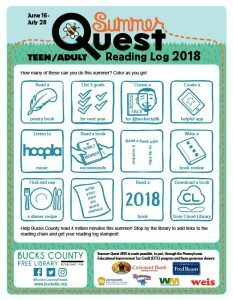 Summer Quest 2018 is made possible, in part, through the Pennsylvania Educational Improvement Tax Credit (EITC) program and donors like Covenant Bank, Fred Beans Automotive, J.P. Mascaro & Sons, Waste Management and Weis Markets. Contact Michelle Wexler, Development Director, at 215.348.0332 x1115 to learn how your business can partner with BCFL to make an impact on the community.